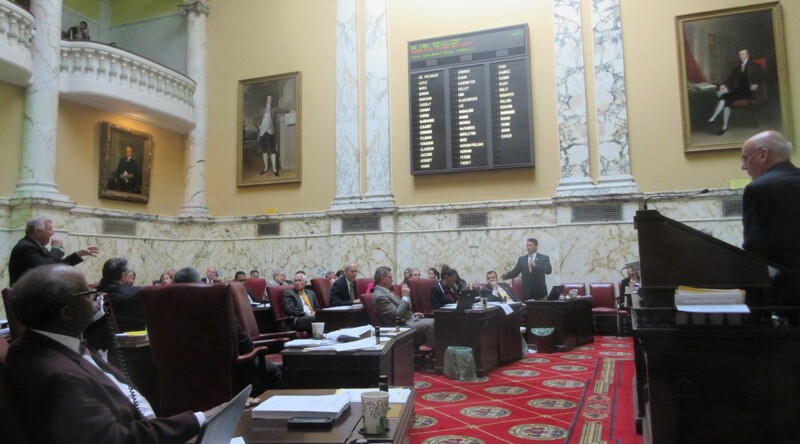 The Maryland Senate debated the budget Wednesday. Budget Chairman Ed Kasemeyer is at the podium, far right. The Maryland Senate Thursday unanimously passed Gov. Hogan’s $42 billion budget. That earned praise from the Republican governor mixed with concern about reductions in the Rainy Day fund and highway user revenues, as well as $132 million in funds fenced off for legislative priorities. “In order to keep moving forward, and to build upon the progress of the past year, we must continue to focus on our long-term finances, live within our means, and strive for the much-needed mandate and tax relief our citizens expect and deserve,” the governor said. “This is the second year in a row” for a unanimous vote, enthused Senate President Mike Miller, urging Republicans to “hold fast.” Last year, the GOP senators voted against the final compromise on the budget at Hogan’s urging. There was no debate on the final vote. The only substantial debate before Wednesday’s preliminary vote in the Senate happened over the annual attempt by pro-life Republicans to remove state Medicaid funding for abortions due to the mental health of the mother. According to information obtained by legislative staff from the Maryland Department of Health and Mental Hygiene, in fiscal 2015, Maryland paid for 6,866 abortions through Medicaid at a cost of about $5 million. That funding came entirely from state tax dollars since federal law prohibits using federal dollar to pay for abortions. The amendment failed 16-27, with two Democrats, Sens. Ed DeGrange and Doug Peters, joining all 14 Republicans supporting the measure.